[dropcap]A[/dropcap]s I’m sure you loyal readers have noticed, we have been previewing a lot of soon-to-be Yankees rookies so far this off-season. I enjoy writing these because a, its nice to know that the Yankees have actual good players in the minors that could contribute next season; and b, because what else am I gonna write about? Anyway, today’s expose is going to be about a young Venezuelan Outfielder named Ramon Flores. Who is this youngster, and will we see him soon? Sit back, and I’ll tell you. 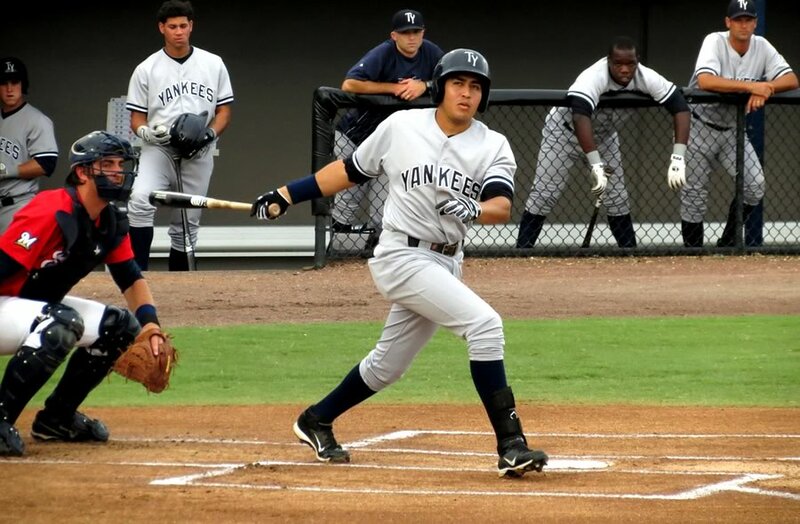 The Yankees signed Flores, a native of Barinas, Venezuela, as an international free agent as a 17-year old in 2008. He made his Rookie League debut with the Gulf Coast Yankees the next year, and has been steadily climbing through the system ever since. He had his first breakout season in 2012, mostly with the Tampa Yankees in A+ ball. That year, he had a triple slash line of .303/.370/.425 with 26 doubles, 2 triples, 11 homers and 59 RBI. He also scored 85 runs and stole 24 bases. All of a sudden, the Yankees had a nice little outfield prospect on their hands. As a 21-year old in AA in 2013, where the average age was 24.6, he pretty much held his own, hitting .260/.353/.363 with 25 doubles, 6 triples, 6 homers and 55 RBI. His stolen bases dropped to 7, but overall it was still a pretty good season for a 21-year old in the Eastern League. He made it to AAA in 2014, and was hitting the ball with some authority before a gruesome ankle injury cut his season short. He ended up hitting .245/.339/.443 with 17 doubles, 4 triples, 7 homers and 23 RBI in just 63 games. If you project that out over a full season, that would be about 38 doubles, 4 triples, 16 homers and 52 RBI. Other than the RBI, that’s a pretty monstrous upgrade from his AA season the year before. Unfortunately, we’ll never know what kind of year he would have ended up with, or if he would have earned a September call-up with the big league club. The great news for the Yankees was that Flores then went to Venezuela and absolutely killed it, hitting .347/.435/.505 with 17 extra-base hits and 29 RBI in just 196 at bats. Granted, the competition is lesser than that of AAA, but at least he crushed it down there. Its a great sign that he’s healthy and ready to make a splash this spring. I don’t think Flores will beat out Chris Young for the fourth outfielder spot, or challenge Garrett Jones‘ roster spot or anything, but he could play the role of Zoilo Almonte in 2015. The minute someone gets injured, or if Young absolutely stinks it up, we’ll probably see Flores in pinstripes. He’ll probably be on the shuttle all year. Can’t wait till we finally get to meet him!